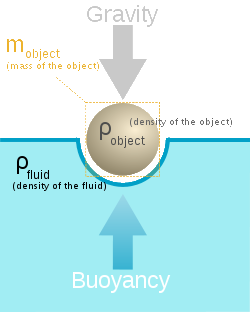 Buoyancy is a force exerted by a liquid, gas or other fluid, that opposes an object’s weight. In a column of fluid, pressure increases with depth as a result of the weight of the overlying fluid. Thus a column of fluid, or an object submerged in the fluid, experiences greater pressure at the bottom of the column than at the top. This difference in pressure results in a net force that tends to accelerate an object upwards. The magnitude of that force is proportional to the difference in the pressure between the top and the bottom of the column, and is also equivalent to the weight of the fluid that would otherwise occupy the column. For this reason, an object whose density is greater than that of the fluid in which it is submerged tends to sink. If the object is either less dense than the liquid or is shaped appropriately (as in a boat), the force can keep the object afloat. This can occur only in a reference frame which either has a gravitational field or is accelerating due to a force other than gravity defining a “downward” direction (that is, a non-inertial reference frame). In a situation of fluid statics, the net upward buoyancy force is equal to the magnitude of the weight of fluid displaced by the body. Archimedes’ principle relates buoyancy to displacement. The weight of the displaced fluid is directly proportional to the volume of the displaced fluid (if the surrounding fluid is of uniform density). In simple terms, the principle states that the buoyant force on an object is going to be equal to the weight of the fluid displaced by the object, or the density of the fluid multiplied by the submerged volume times the gravitational constant, g. Thus, among completely submerged objects with equal masses, objects with greater volume have greater buoyancy. Suppose a rock’s weight is measured as 10 newtons when suspended by a string in a vacuum with gravity acting upon it. Suppose that when the rock is lowered into water, it displaces water of weight 3 newtons. The force it then exerts on the string from which it hangs would be 10 newtons minus the 3 newtons of buoyant force: 10 − 3 = 7 newtons. Buoyancy reduces the apparent weight of objects that have sunk completely to the sea floor. It is generally easier to lift an object up through the water than it is to pull it out of the water.